Review: "AB Tasty - A complete A/B testing package, with great customer support"
A/B Tasty is predominantly used by our analytics department to build and manage experiments. However, hypotheses are submitted from anywhere within the business. The tool allows us to continually optimise our websites and increase our conversions through A/B and multivariate testing as well as serving personalised content. Simple one-tag implementation allows you to get up and running in minimal time. In-page visual editor allows changes to be made to the site without technical expertise. Dedicated account and technical support with impressive turnaround times. Strong segmentation and personalisation options. Occasional glitches within the visual editor, especially with responsive content. Better debugging tools when testing experiments locally i.e. a preview environment. Occasionally when adding goals in to the reporting tool, they will not load immediately. AB Tasty is a comprehensive testing tool that will cater to both marketers as well as technical teams. If you are looking for a reliable A/B testing platform to conduct hypothesis testing or serve personalised content, I would highly recommend it. Review: "AB Tasty, an innovative solution for successful websites"
AB Tasty is mainly used by the marketing team to test different versions of a page on our website, in order to increase the conversion rate and improve user experience. As we are a small company, we usually decide with top managers which tests will be created first and, according to the reports, decide together how to implement changes on the site. Account Managers understand our needs and always listen to our technical or strategic questions. Each month a team from AB Tasty explains through a webinar a key concept of AB testing or tips to be operational and autonomous on the interface, and this is very helpful. AB Tasty's interface is complete, intuitive and innovative. It would be useful to have more examples of winning tests in different industries, it is always inspiring. Apart from traditional options of the interface, it is sometimes difficult to run the tests by ourselves. AB Tasty is a great solution for websites with actions to measure (transactions, leads, subscriptions for instance) and a large volume of visits in order to have relevant figures to analyze. In these cases, implementing winning variations will improve significantly the conversion rate and ROI. Moreover, using a solution like AB Tasty takes time and the company should be well organized to take fully advantage of it. User Review: "Axure + AB Tasty, the winning duo !" We establish different tests and their variations, either in collaboration with an AB Tasty consultant, or internally. AB Tasty is used within the digital department but to serve all the others including marketing, sales, and the information systems division. In case of some ergonomic choices before a redesign or continuous improvement. Review: "AB Tasty a chance to easly testing live new features"
AB Tasty is made to test scenarios in order to understand and simplify the UX on our ecommerce platform. Then with the figures we can decide to finalize the development through our IT team. We learn everyday by testing things that would take longer to develop on the first hand. Testing live special layouts and improving conversion rates. User Review: "My experience with ab tasty"
AB tasty is our CTR, personalization and AB testing tool. The main purpose was to improve our conversion rate. The account management and consulting support (our AB tasty consultant was really good). The simplicity of the tool (can be easily used by a non-developer person). Features (lot of advanced segmentation possibilities with the tool). New features ; new features available very, very often. 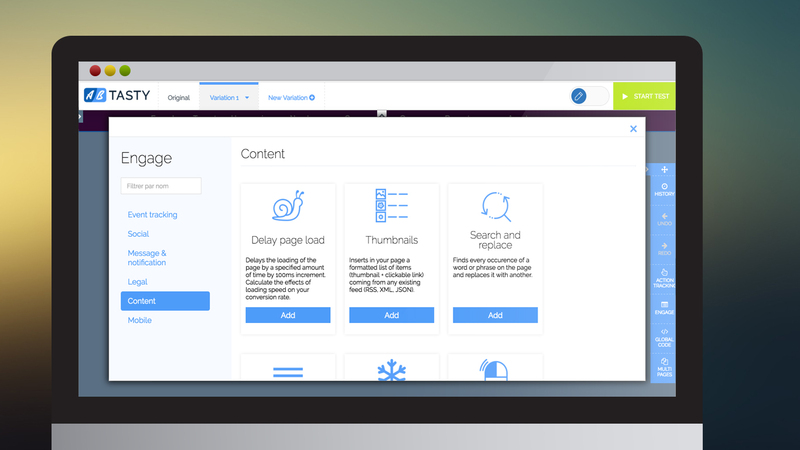 Review: "AB Tasty, optimize your web performance with a tool designed for marketers." The AB Tasty solution is used as part of Eurosport's web presence. Indeed, two departments are using this solution - New Medias and Player. These correspond to our respective sites. Our goals are twofold - to improve our UX and UI, and to increase our conversion rate. A solution for marketers. Indeed, Ab Tasty's Saas solution does not require advanced technical knowledge, and thus allows marketers to regain control over their websites. A team dedicated to listening and performing. This is one of the major strengths of this start-up. Teams are available and accompany us at every moment: from training to the use of the tool, to the implementation of very specific tests. The interface is perfectly thought out. It is intuitive and allows you to make decisions quickly and efficiently with clear and relevant analysis tables. In addition, the solution fits perfectly into our ecosystem because it is connected to our Google Analytics account, our CRM and other internal tools. Finally, listening to their team makes it possible to regularly improve their tool by adding new functionalities according to the needs of the users. One point of improvement could be the implementation of multi-account management. Indeed, being in charge of the management of Eurosport sites around the world we try to share our actions and evolutions on our various sites. Nevertheless, this point is not blocking to the extent that we use our major sites to do our global redesign tests. I think that this need is specific to the media, and that the increasing implementation of customization of the UX brings us to have a more precise approach, which requires a case-by-case study. User Review: "Best A/B solution: AB Tasty"
We used AB Tasty in a research development project. The software is simply genius but quite easy to use. As they are some tricky things, their members' staff are very reactive and efficient to provide solutions and help. A/B Tasty addresses almost all behavioural analysis, UX design problem solving as well as web marketing business problems. A/B campaign tests with easy to read indicators. A wide range of web marketing strategy fine tuning using powerful indicators and evidence from data analytics. A/B testing on a single page is straightforward (text, images, colors, positions are made very very easy to handle) while testing over full site combining different options is a bit tricky. Visualizing best users' responses in adequation to your plans is hence quite easy using their scenario and indicators very visual and comprehensive. "AB Tasty - My conversion rate optimization assistant"
AB Tasty is the solution used by the e-commerce department. We test our optimisation ideas with A/B Testing and multivariate testing. We run also segmentation and personalisation on the website based on audience segmentation and behaviours. The solution is easy to use and the reports are clear and easy to understand. You don't need to be a data scientist to use AB Tasty. AB Tasty is well suited to build and compare two or more variations of the same element on a web page or a conversion funnel. You can also create segment-specific content to personalize your website and increase sales. "Improve your conversion rate with AB Tasty !" I'm currently working as an e-commerce project manager at THOM. I am in charge of the user experience and optimization/projects for histoiredor.com/marc-orian.fr & orovivo.de. We used AB Tasty to make careful changes and validate them before going on line. We also used it to validate a hypothesis and prove that an opinion about the best experience can be proven wrong through an A/B test. And we used it for personalization because the tool is quite simple. We can do a lot of things with all of the available widgets without disturbing our IT team. Ab tasty is well suited for personalisation, to improve the customer experience, validate a scenario, a hypothesis and to improve the conversion rate. AB Tasty Review: "If you plan to become a heavy user of A/B tests to optimize your business, I strongly recommend ABTasty over Kameleoon and Optimizely. Greatest ROI for sure." As a direct marketing/publishing group, we are using it to A/B test everything we do. AB Tasty brings this opportunity to the next level; our marketing department is fully autonomous. With strong reporting capabilities, combined with session recording and heat maps, we can really understand and optimise the user experience. AB Tasty is now [being used] inside all marketing teams across all companies of the group. We started with the acquisition department to optimise both the volume and cost of leads. We then integrated this approach to increase the conversion rate on the order forms. We're now working on up-sells/cross-sells and renewals efforts. After having reviewed Optimizely, Kameleoon, and AB Tasty... we benchmarked the last 2 solutions for 8 weeks. I was already using Kameleoon for a non-profit organization for 18 months but I opted for AB Tasty for an entire commercial group of 9 entities. I was convinced it was the right choice. I'm not the only one today. Provided you solve the minor issues while onboarding staff on the solution for their first tests... they will soon be autonomous. Some are now addicted to A/B testing. The ROI is excellent. Excellent to check optimization hypothesis. Great to know what happens for a user cohort on any web page (website, landing, order form...) thanks to the action tracking. Powerful to change live content without asking IT, optimize pages and customer paths without any technical knowledge. Difficult to handle a lot of content modifications or reorganizations in one single test. Use a new page instead and create a traffic split. Never used the classification of the pages visited during sessions (not well marketed or too complex?). AB Tasty Review: "The perfect optimization tool"
I used AB Tasty for 5 years, at Smartbox (gifbox), and now at Palais des Thés (tea retailer). It is a must-have tool for any e-commerce website for the conversion rate optimization and to set up a specific experience for each customer segment. AB Tasty is managed by 2 project managers and 1 front-end developer but is used by all of the E-Commerce team. AB Tasty is perfect for optimizing your site. It allows you to test your intuitions and measure the impact. AB Tasty's team [members] are there to help. It takes time and It is better to have technical skills (HTML/CSS /JS). Review: "AB Tasty, the best AB Tasting solution !" AB tasty is used by the digital department. It can increase turnover. We have been using AB Tasty to change some information on our website. Our entire checkout cart is optimized by AB Tasty. We can change our homepage in the smartphone thanks to AB Tasty. It is very useful for us. AB Tasty Review: "The best AB Test Saas out there!" We use AB Tasty to test changes on different versions of the same site, which one performs better and customizations. It has been a handy tool as our online platform is accessed by more than 6000 users worldwide. We only use it in our department and not across the whole organisation. Simple interface, easy to use dashboard, reporting, editor and targeting options. Great support form the team to help mazimising efforts and tests. Sometimes when you're preparing a test the editor "crashes" and you need to re open it. It's just a matter of having to go back to the main dashboard a few times during your preparation. Maybe to have the option to have pre-build templates of pages, buttons and assets that we can use to test experiments. I can only mention where AB Tasty has been useful as I haven't had negative experiences on the tests we have carried out. A useful scenario for us is that we use AB Tasty to test changes on pages in a test environment instead of having to test on live. User Review: "AB Tasty has the best customer service"
We use AB Tasty to perform testing on all of our websites. A/B and multi veritable testing. WYSIWYG editor to create page variations. 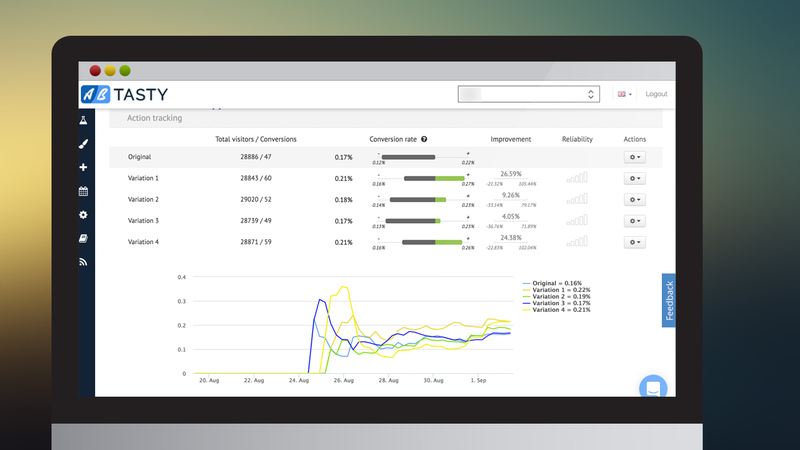 [It's] Great for A/B testing, page variations, reporting, heat maps, and screen recording. The customer service is very helpful in getting you set up and optimizing your tests to suit your needs. I worked with Penaz and she was always very helpful when I couldn't figure out how to set something up, or did set something up and did it wrong. User Review: "AB Tasty - great start to AB Testing." AB tasty was selected by one of our customers after we presented several solutions to them. IT was used as a basis to help the team get informed about AB testing and also to try and find conversion improvement opportunities. The tool was deployed after we shortlisted several key features that we wanted to try after analysing the analytics for the site and identifying locations which were causing friction in customers' ability to transact. We were able to use AB Tasty's prebuilt elements to try out light boxes and other elements that meant we would have had to spend dev time. We could short cut these developments using AB Tasty and only build them if they worked. The user interface is quite clunky and could do with some improvements. They could also do a better job onboarding customers with little experience. When you want to test functionality that it has prebuilt. Text changes and other image changes. Where there are several variants which you want to test and allow other parts of the organisation to self-serve. Complicated pages such as those behind a login are harder to do and should probably be done a different way. AB Tasty Review: "Perfect !" AB tasty is used both as an AB testing tool and a personalization tool for all of our websites all over the world. Regarding the AB testing part, it helps us to test if our idea is right or not, with concrete figures and let us know if we should develop a new feature or not. In parallel, Ab tasty allows us also to easily create marketing messages for our customers and personalize different elements of our website really quickly. AB tasty is well suited for everybody, not only-e-commerce websites but also content websites, as the tool affords you flexibility. AB Tasty Review: "Good tool and support for your CRO project"
Clear and easy user environment. Calendar to plan all my content tests, but I think they are working on it. High level CRO project audit, but we haven't asked about it, maybe they have this service. AB Tasty is a good CRO tool, but it is only a tool. To do a CRO project you need a UX manager, designer, programmer, and a data manager. Or [you can] pay for a full service. AB Tasty Review: "An A/B testing solution essential for our business"
La Croix was the first entity of Bayard Presse that started to use AB Tasty. As the months and years went along, more and more press magazines and websites of the group started to use the solution. Depending on the different AB tests and personalizations, it is different types of employees or departments that use the software. At La Croix, we mostly use AB Tasty as a personalization tool. We have a large number of personalisations to follow the client life cycle. AB Tasty's plugin library is very useful for us. Great client support. We have a dedicated optimization consultant that is available for us and help us in the implementation of our tests and personalizations. The solution is very user-friendly. Even though the software users need to have some basic knowledge of HTML, the UX is pleasant to use. AB Tasty has a great variety of plugins. It is useful when doing marketing actions like pop-ins, expand banners etc. There is no easy way to manage the personalization. For example, if test 1 is displayed then test 2 should not. We have to manually exclude tests/personalizations. AB Tasty can be used to A/B test a specific element, for example, changing the name of a navigation bar category or increasing the size of the price or call to action in an e-commerce product page. Other scenarios could be to add a pop-in on the page with a specific call to action. For example a pop-in for the newsletter subscription. AB Tasty Review: "The best tool based on our current needs"
AB tasty is currently the best tool given our maturity level in AB testing. The target is to give local autonomy to all our countries and liberate the testing in order to improve the omnicommerce customer experience. The support is very efficient and we can "influence" the tool roadmap thanks to our needs. Good tool to start AB testing and become autonomous. Some limitations for very advanced features (server side). AB Tasty Review: "A/B tests for gourmets"
It also addresses delivery and time-to-market issues. Easy way to transform your winner variant to a personalization. Their statistical calculation engine is based on a Bayesian approach. Documentation is not very detailed. The editor is a bit slow to load. AB Tasty is well suited for your test and learn methodology. It's fast and easy to create a test and we can see results in a very short time (depending on our traffic). We can then try a new variant to improve the previous one. 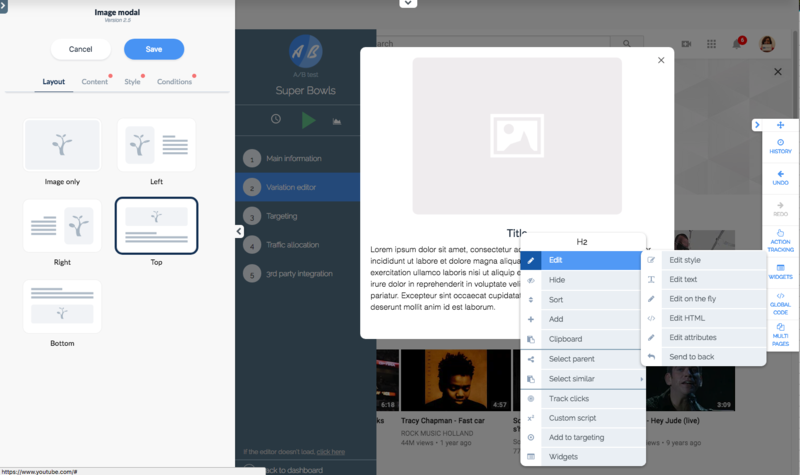 Review: "AB Tasty: a friendly solution for AB-testing and UX personalization"
We use AB Tasty for lots of different missions. First, it helps us to patch very quickly some problems that we have on our website without waiting for a release. Secondly, it helps us to test multi versions in order to bypass the traditional "we like"/"we don't like" that are not relevant. And finally, we use it to personalize our website for a short period of time: the process is easier and the possibilities are more important than what our own back office provides. The account manager is really present and provides us with lots of inputs and advices. AB Tasty could offer or provide a more technical formation for those who want to use the less common functions. AB Tasty could organize once a month a meeting with some of their customers in order to exchange on a subject defined upstream. We used AB Tasty for the Christmas period when messages, visuals, and objectives were constantly shifting from one day to the next. Thanks to this solution, we were able to be very reactive. We are now using AB Tasty to analyse the "click-path" (AA tests) as a means to prepare the future redesign of our interface. User Review: "AB Tasty is Delicious!" AB Tasty is used to run AB Tests, Multi-Page Tests and Personalized CMS Tests across Ashley Furnitures Homestore eCommerce website. Currently, the UX department uses AB Tasty and is fed user stories from various other departments as well to address promotional issues, IT fixes and to pioneer new ideas and functionality as well simple preference (AB) changes to see if an increase in conversion happens. Needs a way to force users into variations on live browser if not included (I believe it is being worked on). Improved heatmap feature (I believe it is being worked on). AB Tasty Review: "Perfect tool to make educated decision about your website"
In the different companies I worked for, we were using AB Tasty in order to make decisions customer oriented. The tool is easy to handle and understand, the support is very responsive and helpful. We are using it mostly for the e-commerce team problematics. 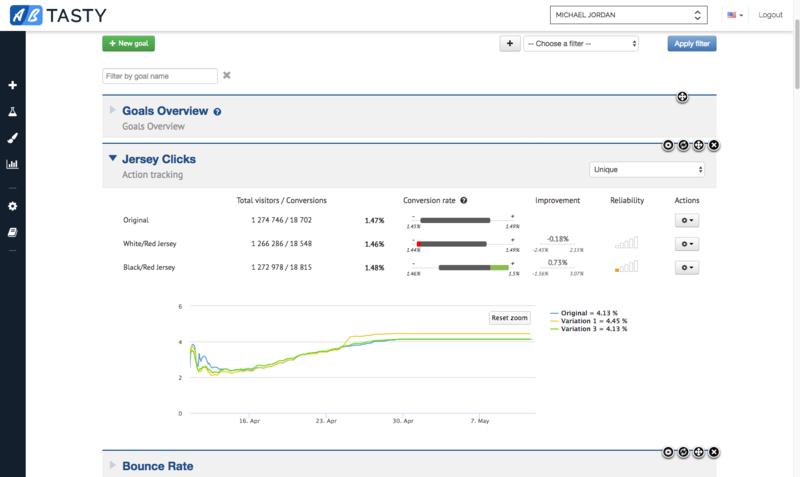 We tested new features very easily which allowed us to improve our main KPI, with very clear results. AB tasty is perfect to make a decision on a topic you have doubt on. 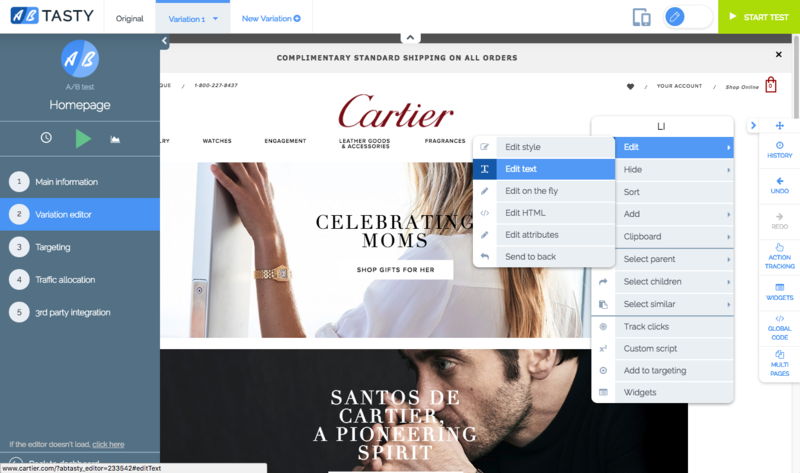 If one of your colleagues is thinking the opposite of you regarding a new feature, visual, or whatever could be on your company website, AB Tasty will solve this issue. By testing the original versus a version B of your website, you will have clear vision on the main KPI you will define. I use AB Tasty for our online website (clever-cloud.com). We are using it to find out which best catch lines work best on our user's acquisition. I do it for both languages: English and French. Segmentation between variations is great. We are offering a new kind of service (platform as a service), so basically, a lot of things have to be done in our marketing field. User Review: ""AB Tasty" is what you need!" As a conversion rate optimization agency, we always have to prove the efficiency of our recommendations and adopt a data driven strategy for our clients. AB Tasty is used by all our consultants, in support of their missions. It helps them backed up their recommendations and is really useful to demonstrate the return on investment of CRO efforts. AB Tasty is really easy to learn and use. Our consultants are up and running quickly without the need for heavy training. This is much appreciated when resources and timing are short. Next, they are independent to make change to the client pages. They don’t have to wait for technical validation and deployment, which means they can test and act really quickly for better results. Our clients often have very specific test scenarios in mind, which involve targeting users based on different criteria such as their behavior, the traffic source they are coming from … This is something that AB Tasty handles very well with advanced targeting options. We almost can answer positively to all our client requests. The AB Tasty support team is fast to answer our requests and its feedback is always valuable. It’s important to have someone we can talk to to get things sorted out quickly without waiting 1 or 2 days. It helps us to be more reactive and get things done right away so we can move to the next topic. It’s inherent to most of client-side tools, but testing modifications that impact the client back-office or database is not possible or quite difficult: we have to ask the client to host the technical changes on a new page and then use AB Tasty split mode to redirect users to the correct pages. Some user interface details can be made clearer and it lacks some contextual help to avoid having to get back to the help center when you need more information. For instance, the” multi page” options is not intuitive and more explanations on how to use it would be appreciated. We lost some time in exchanges with the support to get it right. AB Tasty is perfect to test optimization ideas for different user segments with a lot of targeting options. It’s important to be able to test all kind of scenarios to different people. The report capabilities are also important. We have seen other tools only providing conversion rate, improvement rate and reliability index but no filtering options. To deeply analyze our test results, we need to narrow down the data to some user segments. That’s where AB Tasty makes a difference. You can filter based on the same criteria available for targeting. It can give us really useful insights: if our test doesn't perform well on a global level, they may do well on audience subsets. In terms of marketing actions, it’s really valuable. AB Tasty aims to help marketers optimise their websites and increase conversion rates through A/B testing, personalization and user engagement. Users can modify pages and create new designs with a visual editor and library of widgets called AB Tasty Engage. Users can apply modifications to their website, read statistically accurate results in real-time and improve the user experience. AB Tasty has offices in New York, London, Paris, Nantes, Cologne and Madrid to accommodate clients’ need for prompt support in their own languages. The widget library allows users to add features from scratch, such as pop-ins, surveys, chat functions, countdown banners. Using our widget library, you can also add features from scratch. You’ll find pop-ins, surveys, chat functions, countdown banners and lots more to quickly make your site perform better and improve user experience.Results are displayed in real-time and provide a wealth of information: purchase rates, page views, clicks, time spent on site, etc. Confidence level indicators will also help you make statistically informed decisions.Users can easily modify pages and create new designs thanks to our visual editorResults are displayed in real-time and provide a wealth of information: purchase rates, page views, clicks, time spent on site, etc. Confidence level indicators will also help you make statistically informed decisions.Using our widget library, you can also add features from scratch. You’ll find pop-ins, surveys, chat functions, countdown banners and lots more to quickly make your site perform better and improve user experience.AB Tasty offers multiple criteria to trigger experiments. For example, targeting can be based on weather, geolocation, gender, traffic source, etc. Beyond native criteria, you can reuse third-party data. 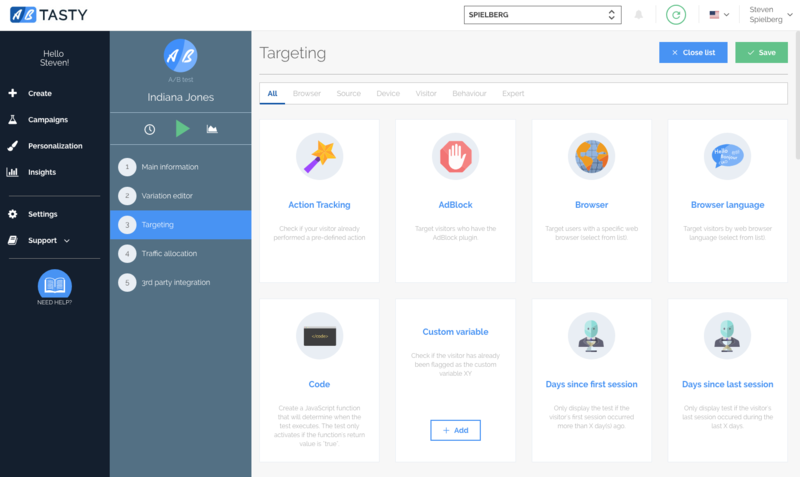 Combined you can build the targeting scenario that fits your project.